North Coast Caravans Ltd. - Caravan Tyres and Wheels - Bude Cornwall. Statistics show that tyre faults are blamed as a leading factor in the cause of caravan damage. It is now recommended to change tyres when they are five years old irrespective of the depth of tread. 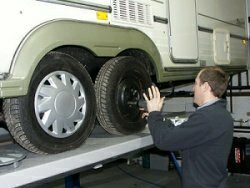 We carry a good range of caravan tyres at very competitive prices and are always happy to carry out safety checks and service inspections. Even when parked in the driveway damage from sunlight causes sidewall hardening and cracking. Which makes it even more likely that a tyre will explode on route wrecking the caravan wheel arch area. The consequences can be far more serious on a motorway! It is illegal to use cross-ply and radial tyres on the same axle. Ensure that any tyres fitted are of the correct speed and load rating. We recommend that you always protect the tyres from sunlight when the caravan is not in use. Always check for any signs of cracking on the sidewall or between the treads before a journey and ensure your tyre pressures are set correctly as per manufacturers instructions. 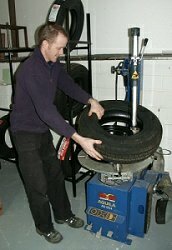 Tighten all wheels with a torque wrench, this will enable you to satisfy yourself all is well prior to every journey. Tyron is a type of runflat system that is fitted to the wheel of a vehicle after the tyre has been fitted, to prevent loss of control during a tyre blow out situation. With TYRON® fitted, you have the piece of mind knowing that you can remain in control and mobile, should your tyre deflate - at any speed - on any surface. It greatly reduces the risk of accident and fatality through loss of control after tyre deflation and provides traction plus a short runflat or get-out capability. Allowing the driver to continue to a safe place to change the wheel. Military & Government: Tested approved and currently used by the Ministry of Defence. NATO part numbers issued. Fitted on military vehicles currently in use in Northern Ireland, Europe and worldwide. British Home Office, ministerial and other government vehicles worldwide. The Army School of Mechanical Engineering Advanced Driver Training Wing and other military, police, government and security training establishments. Police & Security: Fitted by most UK and many other Police forces. Widely used on Police Special Units (PSU's), Armed Response Vehicles (ARV's), Rapid response (RRV's) and Traffic Patrol Vehicles. Standard Fitment for RUC, Northern Ireland. Extensively fitted on cash-in-transit and prison vehicles. Emergency Services, Public Services: Fitted to and approved for use on Fire Appliances (trucks and support vehicles) and Ambulances. In use on minibuses, guided rail vehicles, coaches and buses. Need we say more, if Tyron is good enough for all these services, they're good enough for you. Don't put safety issues off - Phone North Coast Caravans 01288 359 365 for fitting prices and more info.